In an awkward interview with the Huffington Post, House Speaker Paul Ryan threatened to sue Donald Trump if he were to ban Muslim immigration or build a border wall with Mexico. Considering the current track record of suing Obama over abuses of power, this is little more than a confession of impotence. And yet it’s deeply troubling that a top Republican is willing to go to such lengths to fight for Muslim migration or for that matter illegal immigration in general. Paul Ryan insists that he will continue to “speak up in defense of our principles, in defense of not just our party’s principles, but our country’s principles”, but it’s telling that these principles seem to involve illegal immigration and Muslim migration. Since when are either of these representative of our party’s principles or our country’s principles? And yet they are indeed core principles for Paul Ryan. Paul Ryan had complained that a Muslim ban was, “not reflective of our principles not just as a party but as a country.” Like Obama, Ryan speaks of “our principles” without actually referencing specifics. While a constitutional conservative, speaks in terms of the Constitution, Ryan uses the “values” language of the left which references no laws, only general sentiments attributed to no specific law or document. Though Paul Ryan claims that he wants to maintain the traditional separation of powers, and quotes the exact basis for it, he seems reluctant to do so when he claims that a Muslim ban would be wrong. Ryan knows quite well that his opposition to a Muslim migration ban is not based on the law. Like his support for illegal alien amnesty, it is based on the values construct of the left and not on the Constitution. Paul Ryan was a longtime supporter of illegal alien amnesty. Back when amnesty was still being disguised as “immigration reform”, Ryan was a key player in pushing it forward. Ryan was so notorious for his support for illegal alien amnesty that he had to promise not to move forward on it under Obama in order to gain enough support to become Speaker. And yet despite this Ryan continues to sound amnesty notes. Like most of the left, Paul Ryan describes illegal aliens as “undocumented immigrants.” Last year, he once again endorsed some measure of legalization for illegal aliens. Even now his website’s top 5 issues includes a call for “immigration reform” which remains a euphemism for illegal alien amnesty. As is typical of stealth amnesty bids, up front are a raft of security measures and at the very back is a plan for more guest workers and finally a call to “give people a chance to get right with the law”. That is yet another amnesty euphemism. Paul Ryan’s amnesty pledge expires when Obama leaves office. That means that, if we take his website at its word, he would like to push amnesty measures under the next administration. A few years ago he was anticipating a move on “immigration reform” in 2017. And so it is not surprising that he remains less than fond of any calls to crack down on illegal immigration. While Paul Ryan has currently been fairly quiet about amnesty, there was a time when he was one of the more vocal national legislators throwing out amnesty talking points about a “broken immigration system” and “de facto amnesty”. Ryan was certainly not the only prominent Republican to climb on board the amnesty express, but he remained aboard it long after it was leaving the station. Trump’s victory has made it quite clear that Ryan’s view of amnesty, once mainstream in the GOP, is now on the outs. If Trump were to win a national election, then the country would have ratified a rejection of amnesty. The thing that Ryan once fought so hard for, turning illegal aliens into guest workers, was thoroughly rejected by Republican voters. But there is no sign that Ryan is willing to give up or give in. And that is the problem. Paul Ryan insists that a ban on Muslim migration would be wrong because, “Muslims are our partners.” That would come as news to all the Americans killed at home and abroad by “our partners” from Saudi Arabia to Muslim refugees and terrorists operating in the United States. 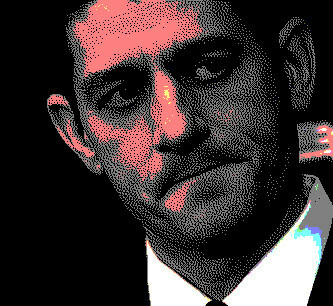 And yet even after the latest Muslim terrorist attack in Orlando, Paul Ryan shows no sign of being willing to reconsider his position. Paul Ryan doesn’t represent any kind of national Republican consensus. Instead he is a vocal and effective spokesman for the point of view of his backers and sponsors. That is why Ryan not only supports illegal alien amnesty, but also backs “sentencing reform”, a euphemism for freeing criminals. Despite the anti-establishment election, Paul Ryan continues to represent a particular strain of elitist establishment politics which is concerned with the advocacy of very specific and specifically destructive policies without regard to their consequences, whether it involves criminals, illegal aliens or Muslim terrorists. These principles are often put forward as conservative, but in fact they are a particular species of libertarianism that has very little regard for national interests and none for their victims. Ryan’s support for illegal immigration and Muslim migration is treasonous. And yet the deeper treason is his treason to the ordinary Republicans whose views and interests he simply does not seem to care about. This is a problem that did not begin with this election and is not likely to end with it. And yet it is a problem that must be confronted. The GOP came dangerously close to endorsing amnesty because special interest agendas mattered more than national interests and community interests. And we are not out of the woods yet. Paul Ryan represents everything wrong with allowing a handful of special interests to set the agenda for the GOP. The agenda has been repudiated at the polls, but it will take far more work to repudiate it in the GOP. And why is he still in that chair, why hasn't someone gone "IN" to his district and blasted him with adds. TV/Radio, I will never understand the "normalcy bias" and then there's the lack of, Cognitive Dissonance. It will probably take Hillary being elected and it all falling apart before people will wake up. Who knows, if i could see the future i wouldn't be so concerned about whats coming down the road in the near future.